This year at WordCamp we will be taking donations and doggy bags (see below!) for African Tails‘ Santa Paws project. Santa Paws is a project that collects and distributes doggy bags to township dogs in need this Christmas. All doggy bags will be distributed by African Tails to townships the Western Cape, such as Joe Slovo and Du Noon. How do I get involved in Santa Paws? Put together a doggy bag for one of our four-legged friends. Items should include a few ‘essential’ items and a ‘toy’. For a list of ideas on what to include, see the wish list below! Bring your doggy bags along to WordCamp and we will collect them from you there. If you don’t have the time to create a doggy bag, you can make a general donation to African Tails for their sterilisation project, or alternatively mark your donation for ‘Santa Paws’ and one of our little helpers will create a doggy bag on your behalf! 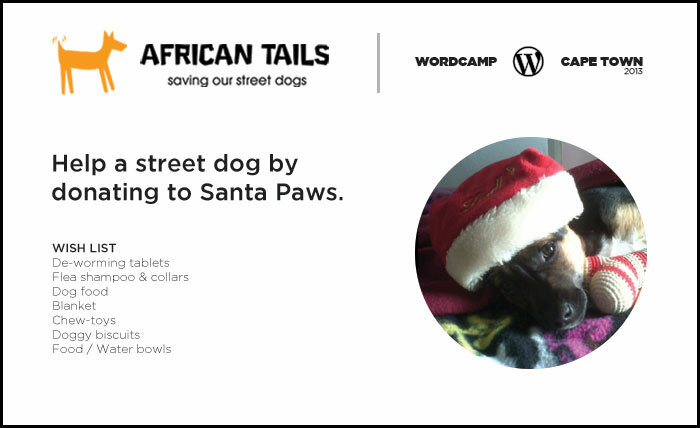 We will have money collection tins for the Santa Paws project at WordCamp. When must my doggy bag be complete? Bring your doggy bag along to WordCamp – we will be collecting the bags at the registration table. We will also have money collection tins available. You can contact June on 076 707 8892 or at jluna@juta.co.za. You can find out more about African tails on their website: http://www.africantails.co.za/. Thanks Celeste – we’ll add that link to the post now!